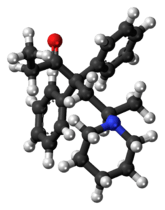 With the exception of oxycodone, dipipanone is now the only alternative opioid left to use in the UK that is of equal strength to morphine that can be prescribed instead. All the other opioids are either weaker like codeine, dihydrocodeine and pethidine or stronger like hydromorphone, oxymorphone, and fentanyl. As of November 2011 Amdipharm stopped making the Diconal brand tablets for the UK due to undisclosed commercial reasons. However the product is listed as available on the manufacturer's website as of July 1, 2014. General practitioners are now advised to prescribe it as generic dipipanone/cyclizine tablets. Prescription of dipipanone is discouraged apart from in exceptional circumstances, because of the perceived risk of abuse - the BNF marks the substance as "less suitable for prescribing" along with other older compounds such as pethidine and pentazocine with unusual abuse patterns. The combination with cyclizine leads to a very strong "rush" if the drug is injected, however the tablets contain insoluble binders which led to many limb amputations and some fatalities (as with temazepam). During the late 1970s to early 1980s in the UK, many deaths were blamed on misuse of this preparation. As supplies became unavailable, opiate users would mix crushed methadone tablets or Physeptone ampoules with crushed Valoid (a cyclizine containing antihistamine) tablets, in an attempt to replicate the effect of Diconal. ↑ Paterson, S (April 1992). "Pharmacokinetics of dipipanone after a single oral dose." (PDF). British Journal of Clinical Pharmacology. 33 (4): 449–50. doi:10.1111/j.1365-2125.1992.tb04066.x. PMC 1381337 . PMID 1349495. ↑ Fang, Glover, Jarman, Gorrod: Inhibition of monoamine oxidase B by dipipanone and cyclizine. Pharmaceutical Sciences (1995), 1(6), 295-296. ↑ Ofner, P.; Walton, E. (1950). "444. Search for new analgesics. Part IV. Variations in the basic side-chain of amidone". Journal of the Chemical Society (Resumed): 2158. doi:10.1039/JR9500002158.